First of all, a photo to prove that Meg and I actually managed to get together for lunch at her favourite gallery in Nelson, The Suter. Meg is the incredibly energetic weaver/blogger from Unravelling and we met a couple of years ago at a writers' retreat held in the Marlborough Sounds at The Portage Resort Hotel. 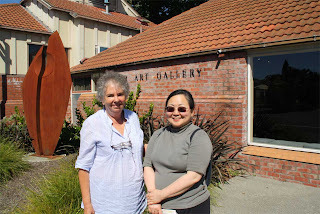 I also met chef Maree Connelly at the same retreat, and while Maree & I also met for lunch, this time in Picton, I didn't take a photo. It was great to catch up with them both, though we do all meet frequently on Facebook. Picton is the gateway to The Marlborough Sounds - just gorgeous in all weathers. I'm afraid it's been a month since I last posted. So to catch up I thought I'd progressively add photos of my trips to New Zealand and then bits of Australia, so today is South Island day. 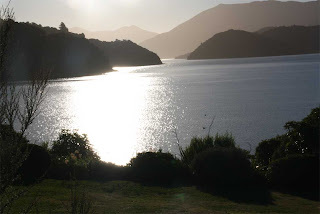 I stayed in Picton with my friends, the owners of The Portage, lazed, rested for most of the two weeks, ate good food, drank lots of NZ Marlborough Sauvignon Blanc wine, played with black poodle Anoop, and had a couple of trips out to the hotel by water taxi (see pic above) - and more great meals there. 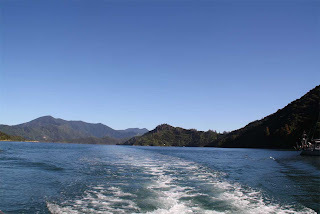 The hotel is more easily reached by water than road (long and windy) and there is something wonderful about zooming along in the salt spray between the hills of The Sounds. One of my most memorable moments was coming home late in the evening and seeing the entire Milky Way spread from one side of the Sounds to the other. Sheer magic. Once at The Portage the views just continue to be wonderful. You don't have to do a thing - just be there. Can you imagine sitting on the verandah, glass of wine, fish & chips at hand, watching the sun set. Can you tell I'm pretty much in love with this place? After two wonderful weeks of this it was farewell to A, D & Anoop - thanks dear friends - as usual, it was a wrench to leave you all. But then, onto one of my other favourite modes of travel. 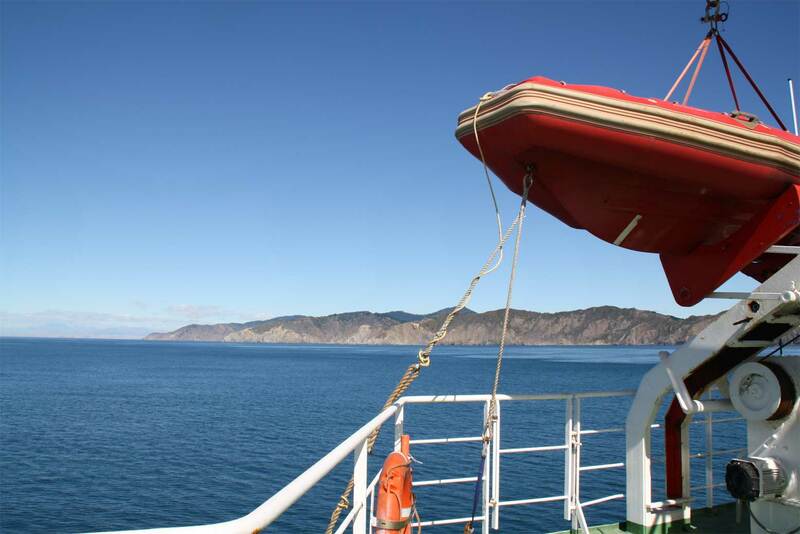 The InterIslander Ferry which plies between Picton on the South Island and Wellington on the North. 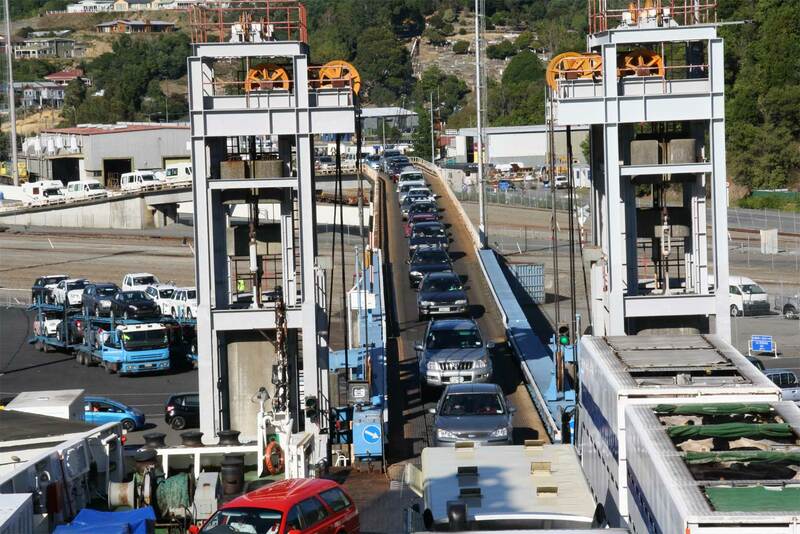 The InterIslander takes cars, trains (goods not passenger) and people and on most days is a very compfortable three hour trip. On a rough day, and I've only experienced one, it's not so good and when the seas are really too rough the sailing is cancelled. I love watching the cars rolling on board and the general busyness of the scene. Sailing through Cook Strait is very beautiful, first with The Sounds on either side, then a short stretch with just the sea and vague outlines of land in the distance, then suddenly the North Island comes into view. Having said that, I think this is still the South Island in the next photo. Once at Wellington I got a taxi to the airport, did a bit of hanging around and then caught a flight to Auckland where I was met, taken off to dinner in the city with my hosts S&T and finally, after a long day fell into my very comfortable bed in the house above Muriwai Beach - another gorgeous location! How lucky was I? More later. Welcome home Carol! So lovely to see you post again after your travels. Your photos are wonderful, NZ looks as if it is a truly beautiful place. One day I will venture across. Looking forward to more tales of the South (in the Pacific). So far, The Man has not seen these pictures;hoping to persuade him over a glass of Marlborough Sauv.Blanc! those photos of the water are very enticing. tranquil but hectic at the same time I imagine. You're home. Boy, that WAS a lovely lunch. FYI, Joan is going to be Writer in Residence in Nelson most of June so I'll be able to see her, regardless of whether I go to her one-day workshop in town. As well, her workshop in the Sounds is going to be sometime around October this year. Lovely shots of the Sounds. I have never been to The Portage, but of course it is very famous. Been on the old inter-island many many times though. Enjoying looking at photos of your travels.